Are cringing and complaining the first reactions you have on waking up on a bright Sunday morning too? Is that like..normal? The thought that the weekend is 50% over just beats out the “the glass is half full” kinda optimism out of me. So to help you (and me for that matter) push those sad Monday blues out, I’m showing you how fun blue can get with this “all blue” outfit. After months and months of searching tirelessly, I at last found the right pair of light blue jeans readers. And I honestly couldn’t have been happier. 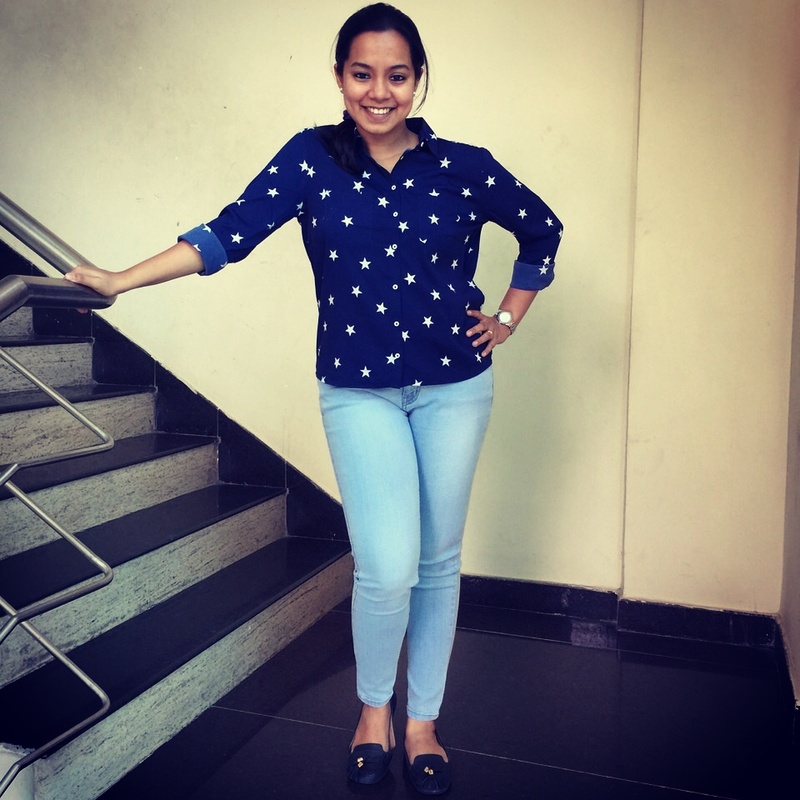 I paired my perfect blue jeans with this midnight blue with white star printed shirt and with my blue Aldo loafers. Sometimes I find that going high on various shades of a single color works after all when we tread with caution and don’t go over board. Do try the technique with soft shades like blue, peach, cream, green etc and SHOW ME! In this case for example, a kind of balance was restored, or so I would like to think, by bringing in many aspects of white into the look. Any pastel shade would actually do the trick, black and white being the perfect colors that they are, would do the trick even better! That brings us to that one accessory which I’ve never shown on this blog though it has been with me for ages now, my Rocky-S bag! Woohoo dont you like love that bag ? 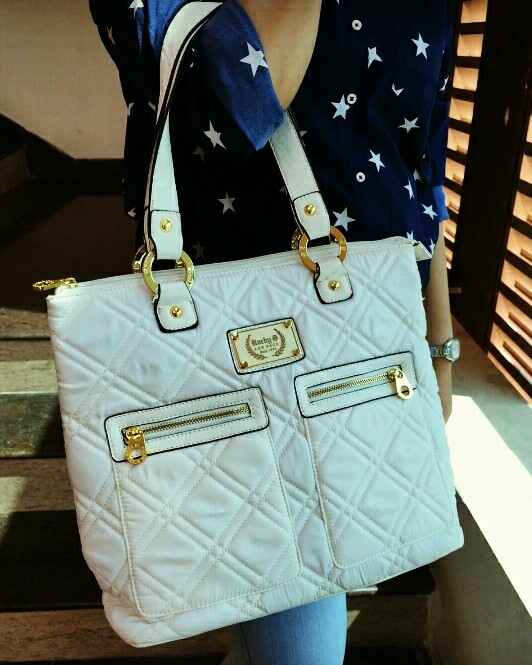 What with the golden zippers and metal rings it gives the whole bag such a “I’m the boss” look. 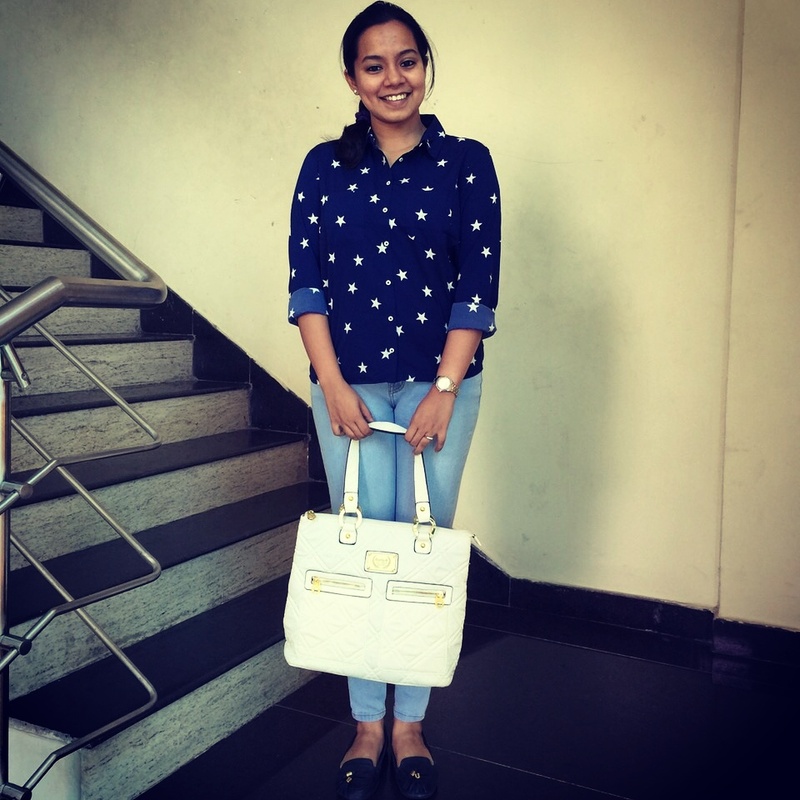 Decoding – Work Wear – Making Monday Fun-day! Hahaha Anu 😀 awesome coincidence. Hope you rocked the green double shade! Ya this ones the 108°F brand and I got it after So much searching. They make jeans for the highly petite and perfectly structured people and so miss thunder thighs (me) finds it to be the least favorite piece of outfit to shop 😧 but I searched and searched some more and got this one. I love your top, it is so cute!! Those pants are totally the perfect shade! And I love them with the stars shirt!! 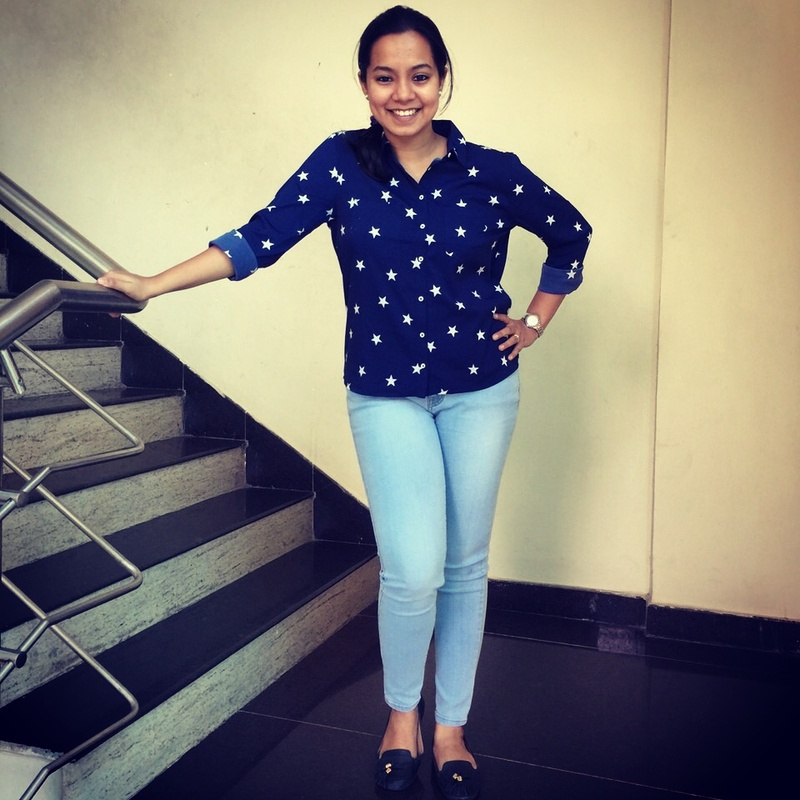 Your blouse is just too damn adorable for anyone’s sake! Like seriously .. it totally reminds me of Mickey’s Mouses iconic wizard get-up Google it if you need a refresher AND this is a compliment because I am the biggest Mickey and Minnie man. You look great Shilpa! This look blue me away hahaha! I love that shirt on you! I am so looking for a shirt like that with stars too! They are so much more better that hearts or polka dots!